July 4th week roadtrip. Cedar Island, Harkers Island, Beaufort and Cape Lookout National Seashore. 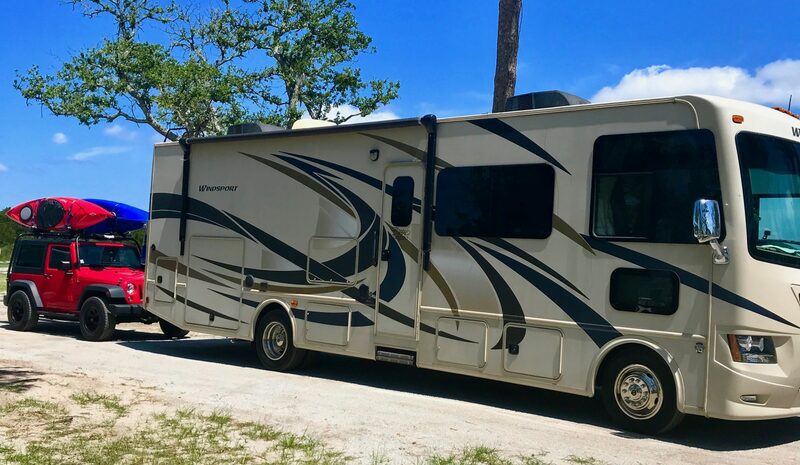 We arrived at Cedar Island RV Resort on Tuesday, July 3rd and explored the southern Outer Banks and surrounding islands for the next 5 days. Cedar Island is on Hwy 12, on the mainland side where you take the ferry to Ocracoke Island on the Outer Banks. The ferry takes about 2.5 hours one way to Ocracoke. You can check out the NC ferry system at NCferry.org. This is a very rural and beautiful area of North Carolina. We had a great time exploring Harkers Island, downtown Beaufort and a day trip by ferry to Cape Lookout. The campground is located beside the state ferry facility and was purchased by a family from Ohio about a year ago. There is also a motel and restaurant that is connected to the campground and some remodeling is being. The restaurant (Sharky’s) is open and busy nightly. No pool, WiFi (only at Sharky’s), no cable. We had a back-in full hook up site on the bay side. Sites are small, but ours (54) was level . Verizon service was poor at campground, I understand that US Cellular works good in the area. They offered golf carts and kayak rentals and have a small boat ramp in the campground. There is also a state wildlife boat ramp beside the campground. They have horses and have beach rides for a fee. This was a great home base to work from to go to all the areas that we explored for the week. The owners are making an effort to improve the campground and there long range plans sounds exciting. One plus for the campground is that they had access to a beach area on the sound that was just beautiful! We were able to drive the jeep out and park on the beach and just about had the whole area to ourselves! We saw alot of the wild horses while we were there. Wild horses on beach near campground. They are located at 3557 Cedar Island Rd, Cedar Island NC 28520. (252)515-0201. To take a break from all the fun and sun on the beach, we decided to take a day and visit Harkers Island and Beaufort. It has been a long time since I have been to Harkers Island, and all I really remember about the trip was that it rainy and cold. I was a young teenager and attended the christening of a 84 foot boat that was build there on Harkers Island by the Rose Brothers. The boat belonged to Ray (Red) Nabors from Fayetteville that my Mom worked for. It was a big event and even had the Governor of North Carolina attend. We checked out the island and stopped at a gift shop that I failed to get the name of. There was an older lady working the cash register and being that the island is not very big, I figured she probably lived their her whole life. I asked her if she remembered Red and his boat, the Atlas. She said that it sounded familiar, but that her husband knew a lot about the boats that were built on the island and most folks that had lived there. I found him outside in his workshop making duck decoys. Small world we live in, he remembered the Atlas and that Red lived beside them on the island. Red has been dead probably over 30 years ago and he said that Red’s lady friend still owned the land. The island was named after Ebenezer Harker who purchased it in 1730 and moved there with his family and built a plantation and boat yard. Separated from the mainland for centuries, many Harker Island residents speak a distinct dialect of English, earning them the nickname “Hoi tolkers” High Tider. A lot of “Down East” folk speak this dialect today. The island saw an influx of new residents after the hurricanes in 1896 and 1899 devastated the communities on the nearby Core Banks and Shackleford Banks. The first public road to extend the length of the island, Harkers Island Dr. was built in 1926 and paved by the county in 1936. The road and post office were connected to the mainland by ferry service until the Earl C Davis Memorial Bridge was built in 1941. This bridge ran from the small town of Straits to the northwestern end of the island. Harkers Island Visitor Center is located at the end of the island, a good place to learn more of the history of the island and area. Also this is where the passenger ferry is located for going over to Cape Lookout Lighthouse and Shackleford Banks to see the wild horses. There is also the Core Sound Waterfowl Museum & Heritage Center. You can learn about the areas waterfowl decoy carvings, exhibits of work boats and commercial fishing industry. The island is a beautiful, laid back place, off the beaten path to visit, sorry I didn’t take no pictures of the area. Thanks for visiting our site, and please check back for our posting on our trip to Cape Lookout National Seashore.